Deletions of chromosome 1p36 affect approximately 1 in 5,000 newborns and constitute the most common terminal chromosomal deletion in humans.1,2 The first reports of individuals with partial monosomy of chromosome 1p36 were published in the early 1980s, starting with a report by Hain et al.3 Many of the individuals described in these reports had unbalanced translocations in which their 1p36 deletions were accompanied by a gain of material from a nonhomologous chromosome.4 While the addition of chromosomal material to the long arm of chromosome 1 made it easier to identify these 1p36 deletions, it also made it more difficult to delineate with certainty the clinical effects of monosomy 1p36. In 1987, Magenis et al5 published the first report of an individual with a de novo isolated 1p36 deletion. With the publication of additional case reports, and the clinical descriptions of large cohorts of individuals with 1p36 deletions, a pattern of characteristic functional deficits, congenital anomalies, and physical features associated with 1p36 deletions emerged.6–8 This pattern included developmental delay, intellectual disability, seizures, vision problems, hearing loss, short stature, brain anomalies, orofacial clefting, congenital heart defects, cardiomyopathy, renal anomalies, and distinctive facial features – straight eyebrows, deeply set eyes, midface retrusion, wide and depressed nasal bridge, long philtrum, pointed chin, large, late-closing anterior fontanel, microbrachycephaly, epicanthal folds, and posteriorly rotated, low-set, abnormal ears (Figures 1 and 2).7 Defining this pattern made the 1p36 deletion syndrome a clinically recognizable entity. At the same time, these reports also highlighted the significant phenotypic variability seen between patients. Figure 1 Facial features of a girl with a terminal 1p36 deletion (chr1:1–3,047,838; GRCh37/hg19). Notes: Photos were taken at (A) 1 year 8 months, (B) 2 years 3 months, (C) 4 years, (D) 7 years, (E) 7 years 11 months, and (F) 10 years 3 months of age. 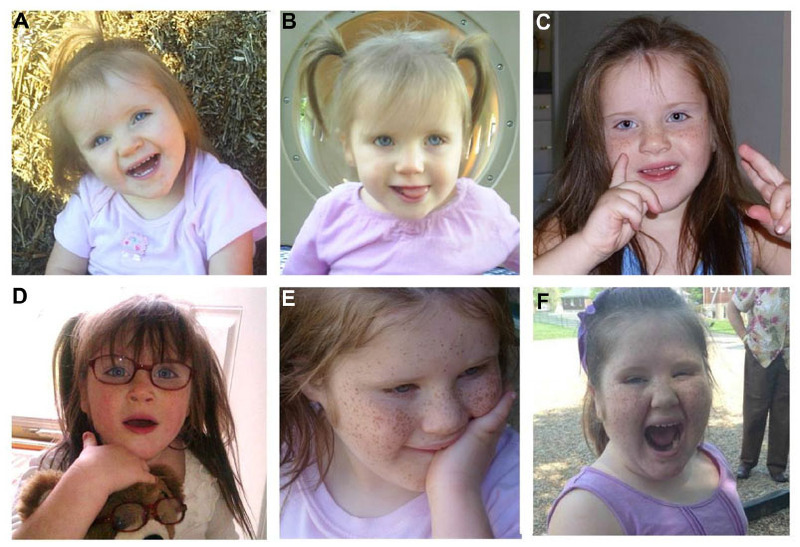 These photos demonstrate several facial features that are typical of children with terminal 1p36 deletions, including straight eyebrows, a wide nasal bridge, and a pointed chin. Figure 2 Facial features of a woman with a large interstitial 1p36 deletion (chr1:3,313,081–12,530,129; GRCh37/hg19). Notes: Photos were taken at (A) birth, (B) 16 months, (C) 5 years, (D) 7 years, (E) 9 years, (F) 14 years, (G) 25 years, (H) 31 years, and (I) 32 years of age. Her deletion partially overlaps the distal critical region and includes the entire proximal critical region of chromosome 1p36. Characteristic facial features that are evident in these photos include straight eyebrows, deeply set eyes and epicanthal folds. Other features that are not readily apparent in these photos include brachycephaly, small, low set ears, and facial hirsutism. At first, it was suggested that the variable phenotypic expression of 1p36 deletions might be caused by a parent-of-origin effect in which deletions of the paternally-derived copy of 1p36 were not equivalent to deletions of the maternally-derived copy due to differences in imprinting. However, Shapira et al4 used DNA polymorphism analysis to show that there was no obvious parent-of-origin effect. Instead, they concluded that phenotypic variability was more likely to be caused by differences in the location and extent of the 1p36 deletions, which varied significantly in the patients they studied. The clinical and genetic heterogeneity seen among individuals with 1p36 deletions present a significant challenge to physicians who are called upon to provide prognostic information to families and to generate individualized care plans for their patients that include appropriate diagnostic and surveillance testing. This challenge arises, in part, because the genes that contribute to most 1p36-related phenotypes have yet to be identified, and many 1p36-related phenotypes may arise from haploinsufficiency for more than one gene within a particular genomic region. In this article, we review recent successes in the effort to map and identify the genes and genomic regions that contribute to specific 1p36-related phenotypes. In particular, we highlight evidence implicating haploinsufficiency of MMP23B, GABRD, SKI, PRDM16, KCNAB2, RERE, UBE4B, CASZ1, PDPN, SPEN, ECE1, HSPG2, and LUZP1 in the development of various 1p36 deletion phenotypes. All of the coordinates referenced in the text and figures are based on human genome build GRCh37/hg19. After the characteristic features of 1p36 deletion syndrome were described, efforts were made to determine the smallest terminal deletion that was required to cause individual 1p36 phenotypes. In a study of 30 individuals with 1p36 deletions, Wu et al11 determined that most genes contributing to the phenotypic features of 1p36 deletion syndrome were located distal to marker D1S2870 (chr1:6,289,764–6,289,973). This region was subsequently referred to as the distal or classical critical region (Figure 3). Figure 3 Critical regions and selected genes on chromosome 1p36. Notes: Chromosome 1p36 spans approximately 30 Mb. Red bars represent the approximate locations of the distal and proximal critical regions. Orange bars represent the approximate locations of critical regions defined for various 1p36-related phenotypes. Green bars represent the approximate locations of selected genes whose haploinsufficiency is likely to contribute to phenotypes associated with 1p36 deletions. Coordinates are based on human genome build GRCh37/hg19. Using array comparative genomic hybridization, Kang et al9 identified interstitial deletions affecting 1p36.23–1p36.11 in five individuals. This cohort included a 5-year-old male with a 2.97 Mb deletion (chr1:8,395,179–11,362,893) that did not overlap the distal critical region. Some of the facial features of this individual were distinct from those typically seen in 1p36 deletions and included frontal and parietal bossing, low-set, posteriorly rotated ears, epicanthal folds, anteverted nares, broad eyebrows, and hirsutism. However, this individual had many of the functional deficits and congenital anomalies commonly associated with deletion of the distal 1p36 critical region including developmental delay, speech delay, failure to thrive, hypotonia, congenital heart defects (a ventricular septal defect and an atrial septal defect), and dilated cardiomyopathy (CMD). Similar features were seen in other members of this cohort who had larger overlapping deletions. After publication of the distal 1p36 critical region, the critical regions for several individual phenotypes associated with terminal 1p36 deletions were refined further. Using large insert clones as markers, Heilstedt et al8 demonstrated that terminal deletions, including RP3-395M20 (chr1:2,424,876–2,425,918) were sufficient to cause large, late-closing anterior fontanels, while those including RP1-37J18 (chr1:4,631,608–4,643,481) could cause hypothyroidism, which is present in 15%–20% of individuals with 1p36 deletions.7 A critical region for cleft palate was defined by Shimida et al13 based on an individual with a terminal 1p36 deletion (chr1:1–2,186,829). Small, partially overlapping deletions that were sufficient to cause seizures were reported by Shimada et al13 (chr1:834,101–1,770,699), Rosenfeld et al14 (chr1:1,747,967–2,181,297), and Zhu et al15 (chr1:2,045,453–2,622,423). A critical region for sensorineural hearing loss was defined by Gajecka et al16 in two siblings, both of whom carried a 1.51 Mb interstitial deletion (chr1:1,916,589–3,429,762). Rather than focusing on the distal critical region, Zaveri et al10 defined five critical regions for congenital heart defects along the entire length of chromosome 1p36 using a combination of published and previously unpublished individuals (chr1:1–2,418,935; chr1:8,395,179–11,362,893; chr1:12,726,755–20,540,759; chr1:20,555,776–23,438,888; chr1:27,803,719–31,404,471). The most distal of these critical regions overlaps partially with the deletion reported by Zhu et al15 (chr1:2,045,453–2,622,423), which was carried by an individual who had an atrial septal defect. In contrast to the relatively large numbers of 1p36 critical regions for congenital heart defects identified by Zaveri et al,10 only two nonoverlapping critical regions for cardiomyopathy were identified by the same group. The first is the distal critical region for left ventricular noncompaction defined by Gajecka et al16 (chr1:1,916,589–3,429,762). The second is a proximally located critical region defined by the same deletion that was used by Kang et al9 to define the proximal critical region for 1p36 (chr1:8,395,179–11,362,893). This individual had CMD that appeared to be independent of his congenital heart defects. 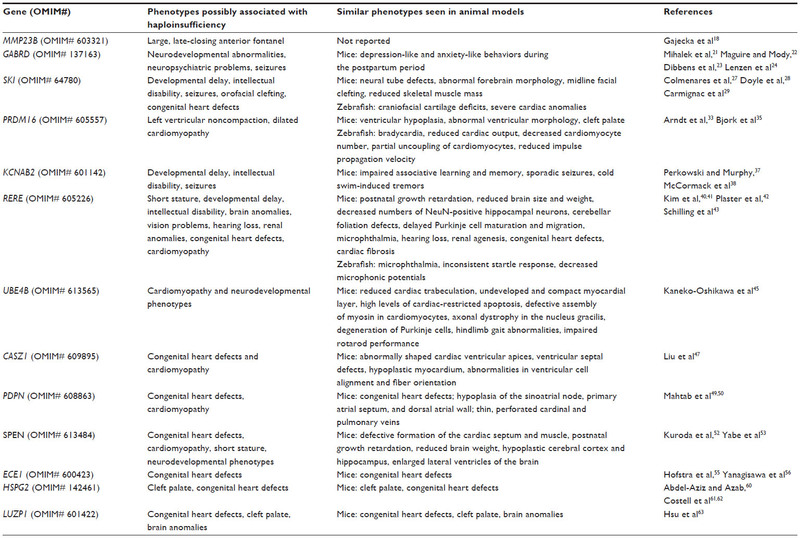 As critical regions for various phenotypes have been delineated, positional candidate genes that may contribute to these phenotypes have also been proposed based on their expression pattern, putative function, or the phenotypes seen in animal models and/or individuals who carry deleterious mutations in these genes. Some of the most strongly implicated 1p36 genes include MMP23B, GABRD, SKI, PRDM16, KCNAB2, RERE, UBE4B, CASZ1, PDPN, SPEN, ECE1, HSPG2, and LUZP1. The data supporting their potential role in 1p36-deletion phenotypes are summarized briefly in the following sections and in Table 1. The matrix metallopeptidase 23B gene (MMP23B; chr1:1,567,560–1,570,030; OMIM# 603321) is located in the critical region for large, late-closing anterior fontanel, delineated by Heilstedt et al,8 and encodes a metallopeptidase that is involved in bone matrix resorption and bone remodeling.17 Gajecka et al18 noted that individuals with deletions involving MMP23B had large, late-closing anterior fontanels, while individuals with duplications involving MMP23B developed craniosynostosis. After demonstrating that MMP23B is expressed in the cranial sutures, they concluded that haploinsufficiency of MMP23B was responsible for the large, late-closing anterior fontanels seen in children with 1p36 deletions. By screening 72 unrelated patients with idiopathic generalized epilepsy, 65 patients with generalized epilepsy with febrile seizures plus (GEFS+), and 66 patients with febrile seizures for mutations in the GABRD gene, Dibbens et al23 identified two sequence variants in GABRD that lead to a significant reduction in maximal GABAA receptor current amplitude. The first of these heterozygous changes (c.530A>C, p.Glu177Ala [p.E177A]) was found in a small family with GEFS+. Since the unaffected mother also carried the mutation, it was thought that this change might represent a susceptibility allele. The second change (c.659G>A, p.Arg220His [p.R220H]) was carried at similar frequencies in individuals with idiopathic generalized epilepsy (8.3%), GEFS+ (3.1%), febrile seizures (4.5%), juvenile myoclonic epilepsy (3.7%), and in controls (4.2%). Despite the fact that the carrier rates among the various epilepsy cohorts and controls were not statistically different, Dibbens et al23 suggested that this functional variant contributes to idiopathic generalized epilepsy and possibly other polygenic epilepsies. At the same time, they conceded that larger sample sizes would be required in order to explore the possibility of statistical associations. Lenzen et al,24 in a larger cohort of 562 German patients and 664 controls, found no association between the p.R220H change and idiopathic generalized epilepsy or juvenile myoclonic epilepsy. Colmenares et al27 demonstrated that Ski-null mice have neural tube defects, abnormal forebrain morphology, midline facial clefting, and reduced skeletal muscle mass. Subsequently, Doyle et al28 showed that knockdown of the two paralogs of mammalian SKI in zebrafish (skia and skib) results in marked craniofacial cartilage deficits and severe cardiac anomalies. Point mutations and small in-frame deletions of SKI have been shown to cause Shprintzen–Goldberg syndrome (OMIM# 182212).28,29 While some features of Shprintzen–Goldberg syndrome are similar to those seen with 1p36 deletions involving SKI – such as developmental delay, intellectual disability, and a high, narrow palate – other features of this disorder are unique, including craniosynostosis, a marfanoid habitus, mitral valve prolapse, aortic root dilatation, and distinct facial features.30,31 One possible explanation for these differences is that the SKI mutations seen in Shprintzen–Goldberg syndrome patients do not create typical loss-of-function alleles. The PR domain containing 16 gene (PRDM16; chr1:2,985,742–3,355,185; OMIM# 605557) encodes a zinc finger transcription factor.32 Several lines of evidence suggest that haploinsufficiency of PRDM16 contributes to left vertricular noncompaction and CMD. PRDM16 is located in the critical region for cardiomyopathy defined by Gajecka et al,16 and PRDM16 protein is expressed in the nuclei of murine and human cardiomyocytes throughout development and into adulthood.33 Arndt et al33 resequenced PRDM16 in 75 nonsyndromic individuals with left vertricular noncompaction and in a series of 131 cardiac biopsies from individuals with CMD. Eight of these samples were found to carry putatively deleterious sequence changes in PRDM16. To confirm the role of PRDM16 in cardiomyopathy, Arndt et al33 performed knockdown of the zebrafish ortholog of PRDM16 using translation-blocking morpholinos. They observed dose-dependent bradycardia and reduced cardiac output in these morphant fish, which was rescued by wild-type human PRDM16 in a dose-dependent fashion. They also observed a decrease in total cardiomyocyte number in morphant fish compared to wild-type controls. This was associated with a decrease in cardiomyocyte proliferation. PRDM16 knockdown also caused partial uncoupling of cardiomyocytes with significant reductions in impulse propagation velocities seen in morphant hearts when compared with those of wild-type controls. PRDM16 has been shown to interact physically with SKI to inhibit transforming growth factor-β signaling.34 Because most of the 1p36 deletions associated with cardiomyopathy include both PRDM16 and SKI – or include the proximal cardiomyopathy critical region defined by Kang et al9 – Arndt et al33 hypothesized that these genes may function together in the development of cardiomyopathy. By injecting subthreshold doses of morpholinos against PRDM16 and SKI independently and in combination, they demonstrated a synergistic genetic interaction between these genes in the development of decreased cardiac output in zebrafish.33 This suggests that depletion of SKI could have a modifying effect on the PRDM16 haploinsufficiency phenotype in cardiomyocytes and, potentially, in other tissues. Studies in mice suggest that haploinsufficiency of PRDM16 may also play a role in the development of other 1p36-deletion phenotypes. Bjork et al35 showed that hearts of PRDM16-deficient mice exhibit ventricular hypoplasia and abnormal ventricular morphology with a cleft between ventricles. These mice also develop cleft palate as a result of micrognathia and failed palate shelf elevation due to physical obstruction by the tongue.35 However, PRDM16 is located outside of the currently reported critical regions for congenital heart defects and cleft palate defined by Zaveri et al10 and by Shimada et al,13 respectively. The arginine-glutamic acid dipeptide (RE) repeats gene (RERE; chr1:8,412,464–8,877,699; OMIM# 605226) is located in the proximal 1p36 critical region and encodes a widely expressed nuclear receptor coregulator.39 Individuals carrying deleterious sequence changes in RERE have not been reported. However, mouse and zebrafish studies of RERE suggest that it may play a role in several 1p36 deletion-related phenotypes, including short stature, developmental delay, intellectual disability, brain anomalies, vision problems, hearing loss, renal anomalies, congenital heart defects, and cardiomyopathy. Kim et al40 demonstrated that compound heterozygous mice carrying a null and a hypomorphic allele of Rere have postnatal growth retardation and reduced brain size and weight independent of somatic growth. Further studies revealed other abnormalities in brain development, including decreased numbers of NeuN-positive hippocampal neurons, cerebellar foliation defects, and delayed Purkinje cell maturation and migration.40,41 These mice also have microphthalmia, hearing loss, renal agenesis, and a variety of congenital heart defects, including aortic arch anomalies, double outlet right ventricle, transposition of the great arteries, and ventricular septal defects. On a different background, RERE-deficient mice of the same genotype did not have congenital heart defects. However, these mice spontaneously developed cardiac fibrosis. The ubiquitination factor E4B gene (UBE4B; chr1:10,093,041–10,241,297; OMIM# 613565) encodes a ubiquitination factor that is involved in multiubiquitin chain assembly.44 UBE4B is located in the cardiomyopathy critical region defined by Kang et al.9 Kaneko-Oshikawa et al45 demonstrated that the hearts of Ube4b-null mice have reduced trabeculation and an undeveloped and compact myocardial layer. They also demonstrated high levels of cardiac-restricted apoptosis and defective assembly of myosin in cardiomyocytes. These results suggest that haploinsufficiency of UBE4B may contribute to both cardiomyopathy and neurodevelopmental abnormalities. The podoplanin gene (PDPN; chr1:13,910,252–13,944,452; OMIM# 608863) encodes an integral membrane glycoprotein, which is preferentially expressed in the vascular endothelium.48 PDPN is located inside one of the congenital heart defect critical regions defined by Zaveri et al,10 but outside those presently described for cardiomyopathy. Although no PDPN mutations have been described in humans, haploinsufficiency of this gene has been suggested as a possible contributor to 1p36 deletion-related cardiac phenotypes based on mouse studies. Mahtab et al49 showed that Pdpn-null mice have high rates of in utero and perinatal death that may be attributable to cardiac-related abnormalities. Structural heart defects identified in these mice include atrioventricular valve anomalies and abnormal coronary artery morphology. Pdpn-null embryos were also found to have hypoplasia of the sinoatrial node, primary atrial septum, and dorsal atrial wall.50 The myocardium lining the wall of the cardinal and pulmonary veins of these mice was also found to be thin and perforated. The spen family transcriptional repressor gene (SPEN; chr1:16,174,359–16,266,950; OMIM# 613484) is located in one of the congenital heart defect critical regions defined by Zaveri et al,10 but outside of the currently defined critical regions for cardiomyopathy. SPEN is a transcriptional repressor that may function as a nuclear matrix platform that organizes and integrates transcriptional responses.51 Kuroda et al52 reported that Spen-null embryos die in utero and have defective formation of the cardiac septum and muscle. These embryos also had perturbed differentiation of pancreatic exocrine and endocrine cells, hypoplastic livers, and abnormal B-cell differentiation. To analyze the function of SPEN in postnatal mice, Yabe et al53 developed Spen-conditional knockout mice. They subsequently ablated Spen throughout the nervous system using a transgenic nestin-Cre. Although the resulting mice were born at expected numbers and were morphologically indistinguishable from their littermates, they exhibited postnatal growth retardation. Their brain weight was reduced and histological analyses revealed severe reductions in cerebral cortex thickness and hippocampus size accompanied by enlargement of the lateral ventricles. Disruption of Spen in forebrain neurons using a transgenic CaMKIIα-Cre also resulted in brain hypoplasia. Thus, they concluded that Spen is required for survival of neurons in the postnatal mouse brain. Taken together, these findings suggest that haploinsufficiency of SPEN may contribute to the congenital heart defects, cardiomyopathy, short stature, and neurodevelopmental phenotypes associated with 1p36 deletions. Haploinsufficiency of the endothelin-converting enzyme 1 gene (ECE1; chr1:21,543,740–21,672,034; OMIM# 600423) has been suggested as a possible contributor to congenital heart defects and is located in one of the congenital heart defect critical regions defined by Zaveri et al.10 ECE1 is a metalloprotease that is involved in the proteolytic processing of endothelin precursors to biologically active peptides.54 Hofstra et al55 identified a heterozygous missense mutation in the ECE1 gene of an individual with patent ductus arteriosus, a ventricular septal defect, an atrial septal defect, Hirschsprung disease, and autonomic dysfunction. This mutation is located in the vicinity of the ECE1 active site and severely compromises ECE1 activity. Yanagisawa et al56 have shown that Ece1-null mice have a similar phenotype that includes cardiac defects – interrupted aortic arch, absent right subclavian artery, double outlet right ventricle, truncus arteriosus, double aortic arch, overriding aorta, and ventricular septal defects – and absence of the enteric neurons of the distal gut. These mice also display a variety of craniofacial anomalies, defects of the outer and middle ear, and absence of epidermal melanocytes. The heparan sulfate proteoglycan 2 gene (HSPG2; chr1:22,148,737–22,263,750; OMIM# 142461) encodes perlecan, a large multidomain heparan sulfate proteoglycan of the extracellular matrix that binds to various basement membrane proteins.57,58 Recessive mutations in HSPG2 have been shown to underlie two skeletal dysplasia syndromes; dyssegmental dysplasia Silverman-Handmaker type (OMIM# 224410) and the less severe Schwartz–Jampel syndrome, type 1 (OMIM# 255800).58,59 Cleft palate can be seen in both of these syndromes.60 Similarly, Hspg2-null embryos also have skeletal abnormalities and cleft palates.61 Although congenital heart defects are not typical features associated with dyssegmental dysplasia Silverman-Handmaker type or Schwartz–Jampel syndrome, type 1, Hspg2-null embryos have cardiac anomalies, including transposition of the great arteries and malformations of the semilunar valves.62 HSPG2 is also located in one of the congenital heart defect critical regions defined by Zaveri et al.10 These findings suggest that haploinsufficiency of HSPG2 may contribute to the development of both cleft palate and congenital heart defects. The leucine zipper protein 1 gene (LUZP1; chr1:23,410,516–23,495,351; OMIM# 601422) is located in one of the congenital heart defect critical regions defined by Zaveri et al.10 Although the phenotypic consequences of mutations in LUZP1 have not been described in humans, Hsu et al63 demonstrated that Luzp1-null mice have congenital heart defects, including double outlet right ventricle, transposition of the great arteries, and ventricular septal defects. Other features seen in these mice include cleft palate and abnormal brain development.63 This suggests that haploinsufficiency of LUZP1 may contribute to defects in cardiac, palatal, and brain development/function. In contrast to the large numbers of 1p36 deletions that have been reported in the literature, relatively few cases of isolated 1p36 copy number gains have been published. Giannikou et al64 reported two individuals with relatively small, de novo, isolated terminal 1p36 duplications (chr1:1–1,565,789 and chr1:1–1,565,607): a 6-month-old male with hypotonia and severe psychomotor delay and a 17-year-old male with growth hormone deficiency, short stature, psychomotor delay, and left ventricular hypertrophy. Subsequently, Xu et al65 reported an 8-year-old female who carried four copies of approximately 5.28 Mb of the terminal region of 1p36. Her phenotypes included feeding difficulties in infancy, developmental delay, seizures, microcephaly, strabismus, hypertelorism, a low hairline, ear malformations, a broad nasal bridge, wide mouth, thick lips, and prominent incisors. Parental FISH was normal, suggesting that this tetrasomy was de novo. 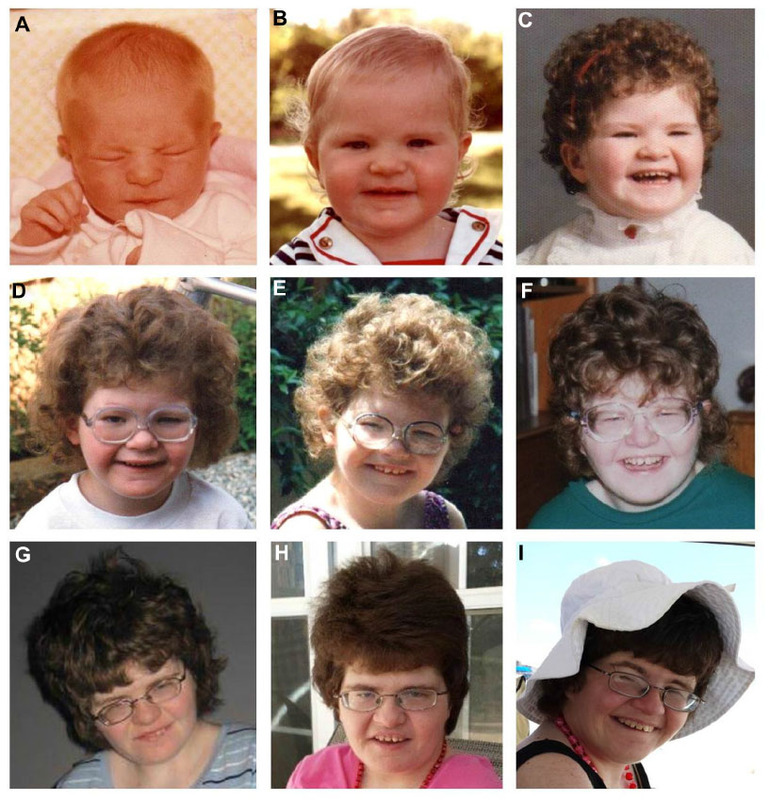 Recently, Weaver et al66 reported the identification of 1p36.22p36.21 duplications and triplications in three individuals with focal facial dermal dysplasia 3, Setleis type (OMIM# 227260). This disorder is characterized by congenital bitemporal or preauricular atrophic skin lesions with variable facial findings, which may include thin and puckered periorbital skin, redundant facial skin, upslanting palpebral fissures, distichiasis and/or absent eyelashes, a flat nasal bridge with a broad nasal tip and large lips.67 The minimum overlapping region in these patients extended from nucleotides 11,696,993 to 12,920,040. Most of the genes currently implicated in the development of 1p36 deletion-related phenotypes have been identified through a combination of molecular cytogenetic mapping, resequencing of positional candidate genes in humans, and/or the development of animal models. It is likely that the expanding use of array-based copy number variant detection assays will speed the identification of individuals with small 1p36 deletions that can be used to refine the 1p36 critical regions that have already been delineated and to identify new critical regions. At the same time, exome and genome sequencing efforts will help identify genes whose haploinsufficiency contributes significantly to an increased risk of developing specific 1p36-related phenotypes. Cellular and animal models will continue to provide important supportive evidence for the contribution of these genes and may also provide the initial evidence that a gene is involved in a particular phenotype. As a comprehensive deletion/phenotype map of the 1p36 region emerges from these efforts, physicians will find it easier to provide the prognostic information desired by families affected by 1p36 deletions and to generate individualized care plans for their patients who carry these deletions. The authors would like to thank the families who contributed to this review by providing photographs and consenting to their publication. Shaffer LG, Lupski JR. Molecular mechanisms for constitutional chromosomal rearrangements in humans. Annu Rev Genet. 2000;34:297–329. Heilstedt HA, Ballif BC, Howard LA, Kashork CD, Shaffer LG. Population data suggest that deletions of 1p36 are a relatively common chromosome abnormality. Clin Genet. 2003;64(4):310–316. Hain D, Leversha M, Campbell N, Daniel A, Barr PA, Rogers JG. The ascertainment and implications of an unbalanced translocation in the neonate. Familial 1:15 translocation. Aust Paediatr J. 1980;16(3):196–200. Shapira SK, McCaskill C, Northrup H, et al. Chromosome 1p36 deletions: the clinical phenotype and molecular characterization of a common newly delineated syndrome. Am J Hum Genet. 1997;61(3):642–650. Magenis RE, Shehy R, Lacey D, Brown MG, Litt M. Small terminal deletion of chromosome 1 short arm in an infant with multiple anomalies: confirmation by in situ hyridization of rove p1-79. Am J Hum Genet. 1987;41:A130. Slavotinek A, Shaffer LG, Shapira SK. Monosomy 1p36. J Med Genet. 1999;36(9):657–663. Battaglia A, Hoyme HE, Dallapiccola B, et al. Further delineation of deletion 1p36 syndrome in 60 patients: a recognizable phenotype and common cause of developmental delay and mental retardation. Pediatrics. 2008;121(2):404–410. Heilstedt HA, Ballif BC, Howard LA, et al. Physical map of 1p36, placement of breakpoints in monosomy 1p36, and clinical characterization of the syndrome. Am J Hum Genet. 2003;72(5):1200–1212. Kang SH, Scheffer A, Ou Z, et al. Identification of proximal 1p36 deletions using array-CGH: a possible new syndrome. Clin Genet. 2007; 72(4):329–338. Zaveri HP, Beck TF, Hernandez-Garcia A, et al. Identification of critical regions and candidate genes for cardiovascular malformations and cardiomyopathy associated with deletions of chromosome 1p36. PLoS One. 2014;9(1):e85600. Wu YQ, Heilstedt HA, Bedell JA, et al. Molecular refinement of the 1p36 deletion syndrome reveals size diversity and a preponderance of maternally derived deletions. Hum Mol Genet. 1999;8(2):313–321. Nicoulaz A, Rubi F, Lieder L, et al. Contiguous approximately 16 Mb 1p36 deletion: dominant features of classical distal 1p36 monosomy with haplo-lethality. Am J Med Genet A. 2011;155A(8):1964–1968. Shimada S, Shimojima K, Okamoto N, et al. Microarray analysis of 50 patients reveals the critical chromosomal regions responsible for 1p36 deletion syndrome-related complications. Brain Dev. 2015; 37(5):515–526. Rosenfeld JA, Crolla JA, Tomkins S, et al. Refinement of causative genes in monosomy 1p36 through clinical and molecular cytogenetic characterization of small interstitial deletions. Am J Med Genet A. 2010;152A(8):1951–1959. Zhu X, Zhang Y, Wang J, Yang JF, Yang YF, Tan ZP. 576 kb deletion in 1p36.33-p36.32 containing SKI is associated with limb malformation, congenital heart disease and epilepsy. Gene. 2013;528(2):352–355. Gajecka M, Saitta SC, Gentles AJ, et al. Recurrent interstitial 1p36 deletions: evidence for germline mosaicism and complex rearrangement breakpoints. Am J Med Genet A. 2010;152A(12):3074–3083. Clancy BM, Johnson JD, Lambert AJ, et al. A gene expression profile for endochondral bone formation: oligonucleotide microarrays establish novel connections between known genes and BMP-2-induced bone formation in mouse quadriceps. Bone. 2003;33(1):46–63. Gajecka M, Yu W, Ballif BC, et al. Delineation of mechanisms and regions of dosage imbalance in complex rearrangements of 1p36 leads to a putative gene for regulation of cranial suture closure. Eur J Hum Genet. 2005;13(2):139–149. Windpassinger C, Kroisel PM, Wagner K, Petek E. The human gamma-aminobutyric acid A receptor delta (GABRD) gene: molecular characterisation and tissue-specific expression. Gene. 2002;292(1–2):25–31. Mohler H. GABA(A) receptor diversity and pharmacology. Cell Tissue Res. 2006;326(2):505–516. Mihalek RM, Banerjee PK, Korpi ER, et al. Attenuated sensitivity to neuroactive steroids in gamma-aminobutyrate type A receptor delta subunit knockout mice. Proc Natl Acad Sci U S A. 1999;96(22):12905–12910. Maguire J, Mody I. GABA(A)R plasticity during pregnancy: relevance to postpartum depression. Neuron. 2008;59(2):207–213. Dibbens LM, Feng HJ, Richards MC, et al. GABRD encoding a protein for extra- or peri-synaptic GABAA receptors is a susceptibility locus for generalized epilepsies. Hum Mol Genet. 2004;13(13):1315–1319. Lenzen KP, Heils A, Lorenz S, Hempelmann A, Sander T. Association analysis of the Arg220His variation of the human gene encoding the GABA delta subunit with idiopathic generalized epilepsy. Epilepsy Res. 2005;65(1–2):53–57. Medrano EE. Repression of TGF-beta signaling by the oncogenic protein SKI in human melanomas: consequences for proliferation, survival, and metastasis. Oncogene. 2003;22(20):3123–3129. Chen D, Xu W, Bales E, et al. SKI activates Wnt/beta-catenin signaling in human melanoma. Cancer Res. 2003;63(20):6626–6634. Colmenares C, Heilstedt HA, Shaffer LG, et al. Loss of the SKI proto-oncogene in individuals affected with 1p36 deletion syndrome is predicted by strain-dependent defects in Ski-/- mice. Nat Genet. 2002; 30(1):106–109. Doyle AJ, Doyle JJ, Bessling SL, et al. Mutations in the TGF-beta repressor SKI cause Shprintzen-Goldberg syndrome with aortic aneurysm. Nat Genet. 2012;44(11):1249–1254. Carmignac V, Thevenon J, Ades L, et al. In-frame mutations in exon 1 of SKI cause dominant Shprintzen-Goldberg syndrome. Am J Hum Genet. 2012;91(5):950–957. Shprintzen RJ, Goldberg RB. Dysmorphic facies, omphalocele, laryngeal and pharyngeal hypoplasia, spinal anomalies, and learning disabilities in a new dominant malformation syndrome. Birth Defects Orig Artic Ser. 1979;15(5B):347–353. Robinson PN, Neumann LM, Demuth S, et al. Shprintzen-Goldberg syndrome: fourteen new patients and a clinical analysis. Am J Med Genet A. 2005;135(3):251–262. Mochizuki N, Shimizu S, Nagasawa T, et al. A novel gene, MEL1, mapped to 1p36.3 is highly homologous to the MDS1/EVI1 gene and is transcriptionally activated in t(1;3)(p36;q21)-positive leukemia cells. Blood. 2000;96(9):3209–3214. Arndt AK, Schafer S, Drenckhahn JD, et al. Fine mapping of the 1p36 deletion syndrome identifies mutation of PRDM16 as a cause of cardiomyopathy. Am J Hum Genet. 2013;93(1):67–77. Takahata M, Inoue Y, Tsuda H, et al. SKI and MEL1 cooperate to inhibit transforming growth factor-beta signal in gastric cancer cells. J Biol Chem. 2009;284(5):3334–3344. McCormack K, McCormack T, Tanouye M, Rudy B, Stuhmer W. Alternative splicing of the human Shaker K+ channel beta 1 gene and functional expression of the beta 2 gene product. FEBS Lett. 1995; 370(1–2):32–36. Perkowski JJ, Murphy GG. Deletion of the mouse homolog of KCNAB2, a gene linked to monosomy 1p36, results in associative memory impairments and amygdala hyperexcitability. J Neurosci. 2011;31(1):46–54. McCormack K, Connor JX, Zhou L, et al. Genetic analysis of the mammalian K+ channel beta subunit Kvbeta 2 (Kcnab2). J Biol Chem. 2002;277(15):13219–13228. Zoltewicz JS, Stewart NJ, Leung R, Peterson AS. Atrophin 2 recruits histone deacetylase and is required for the function of multiple signaling centers during mouse embryogenesis. Development. 2004; 131(1):3–14. Kim BJ, Zaveri HP, Shchelochkov OA, et al. An allelic series of mice reveals a role for RERE in the development of multiple organs affected in chromosome 1p36 deletions. PLoS One. 2013;8(2):e57460. Kim BJ, Scott DA. Mouse model reveals the role of RERE in cerebellar foliation and the migration and maturation of Purkinje cells. PLoS One. 2014;9(1):e87518. Plaster N, Sonntag C, Schilling TF, Hammerschmidt M. REREa/Atrophin-2 interacts with histone deacetylase and Fgf8 signaling to regulate multiple processes of zebrafish development. Dev Dyn. 2007;236(7):1891–1904. Schilling TF, Piotrowski T, Grandel H, et al. Jaw and branchial arch mutants in zebrafish I: branchial arches. Development. 1996;123:329–344. Koegl M, Hoppe T, Schlenker S, Ulrich HD, Mayer TU, Jentsch S. A novel ubiquitination factor, E4, is involved in multiubiquitin chain assembly. Cell. 1999;96(5):635–644. Kaneko-Oshikawa C, Nakagawa T, Yamada M, et al. Mammalian E4 is required for cardiac development and maintenance of the nervous system. Mol Cell Biol. 2005;25(24):10953–10964. Vacalla CM, Theil T. Cst, a novel mouse gene related to Drosophila Castor, exhibits dynamic expression patterns during neurogenesis and heart development. Mech Dev. 2002;118(1–2):265–268. Liu Z, Li W, Ma X, et al. Essential role of the zinc finger transcription factor Casz1 for mammalian cardiac morphogenesis and development. J Biol Chem. 2014;289(43):29801–29816. Zimmer G, Oeffner F, Von Messling V, et al. Cloning and characterization of gp36, a human mucin-type glycoprotein preferentially expressed in vascular endothelium. Biochem J. 1999;341(Pt 2):277–284. Mahtab EA, Wijffels MC, Van Den Akker NM, et al. Cardiac malformations and myocardial abnormalities in podoplanin knockout mouse embryos: correlation with abnormal epicardial development. Dev Dyn. 2008;237(3):847–857. Mahtab EA, Vicente-Steijn R, Hahurij ND, et al. Podoplanin deficient mice show a RhoA-related hypoplasia of the sinus venosus myocardium including the sinoatrial node. Dev Dyn. 2009;238(1):183–193. Sierra OL, Cheng SL, Loewy AP, Charlton-Kachigian N, Towler DA. MINT, the Msx2 interacting nuclear matrix target, enhances Runx2-dependent activation of the osteocalcin fibroblast growth factor response element. J Biol Chem. 2004;279(31):32913–32923. Kuroda K, Han H, Tani S, et al. Regulation of marginal zone B cell development by MINT, a suppressor of Notch/RBP-J signaling pathway. Immunity. 2003;18(2):301–312. Yabe D, Fukuda H, Aoki M, et al. Generation of a conditional knockout allele for mammalian Spen protein Mint/SHARP. Genesis. 2007; 45(5):300–306. Schmidt M, Kroger B, Jacob E, et al. Molecular characterization of human and bovine endothelin converting enzyme (ECE-1). FEBS Lett. 1994;356(2–3):238–243. Hofstra RM, Valdenaire O, Arch E, et al. A loss-of-function mutation in the endothelin-converting enzyme 1 (ECE-1) associated with Hirschsprung disease, cardiac defects, and autonomic dysfunction. Am J Hum Genet. 1999;64(1):304–308. Yanagisawa H, Yanagisawa M, Kapur RP, et al. Dual genetic pathways of endothelin-mediated intercellular signaling revealed by targeted disruption of endothelin converting enzyme-1 gene. Development. 1998;125(5):825–836. Farach-Carson MC, Carson DD. Perlecan – a multifunctional extracellular proteoglycan scaffold. Glycobiology. 2007;17(9):897–905. Nicole S, Davoine CS, Topaloglu H, et al. Perlecan, the major proteoglycan of basement membranes, is altered in patients with Schwartz-Jampel syndrome (chondrodystrophic myotonia). Nat Genet. 2000; 26(4):480–483. Arikawa-Hirasawa E, Wilcox WR, Le AH, et al. Dyssegmental dysplasia, Silverman-Handmaker type, is caused by functional null mutations of the perlecan gene. Nat Genet. 2001;27(4):431–434. Abdel-Aziz M, Azab NA. A case of Schwartz-Jampel syndrome with cleft palate. Int J Pediatr Otorhinolaryngol. 2009;73(11):1601–1603. Costell M, Gustafsson E, Aszodi A, et al. Perlecan maintains the integrity of cartilage and some basement membranes. J Cell Biol. 1999; 147(5):1109–1122. Costell M, Carmona R, Gustafsson E, Gonzalez-Iriarte M, Fassler R, Munoz-Chapuli R. Hyperplastic conotruncal endocardial cushions and transposition of great arteries in perlecan-null mice. Circ Res. 2002; 91(2):158–164. Hsu CY, Chang NC, Lee MW, et al. LUZP deficiency affects neural tube closure during brain development. Biochem Biophys Res Commun. 2008;376(3):466–471. Giannikou K, Fryssira H, Oikonomakis V, et al. Further delineation of novel 1p36 rearrangements by array-CGH analysis: narrowing the breakpoints and clarifying the “extended” phenotype. Gene. 2012;506(2):360–368. Xu F, Zhang YN, Cheng DH, et al. The first patient with a pure 1p36 microtriplication associated with severe clinical phenotypes. Mol Cytogenet. 2014;7(1):64. Weaver DD, Norby AR, Rosenfeld JA, et al. Chromosome 1p36.22p36.21 duplications/triplication causes Setleis syndrome (focal facial dermal dysplasia type III). Am J Med Genet A. 2015;167(5):1061–1070. Slavotinek AM, Mehrotra P, Nazarenko I, et al. Focal facial dermal dysplasia, type IV, is caused by mutations in CYP26C1. Hum Mol Genet. 2013;22(4):696–703.